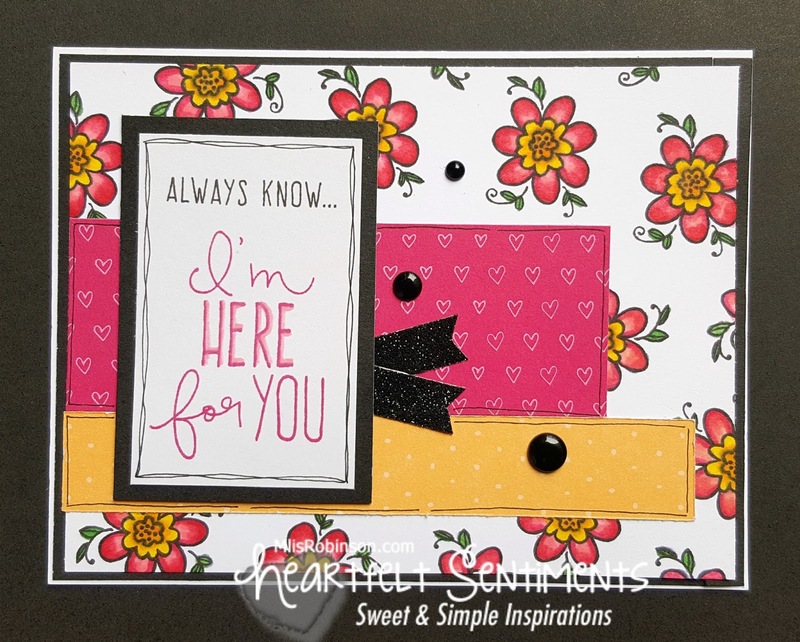 Welcome to this week's Heart to Heart Challenge were we are highlighting "Stamped Backgrounds", a fun technique that allows you to create your own patterned paper of any design and color. 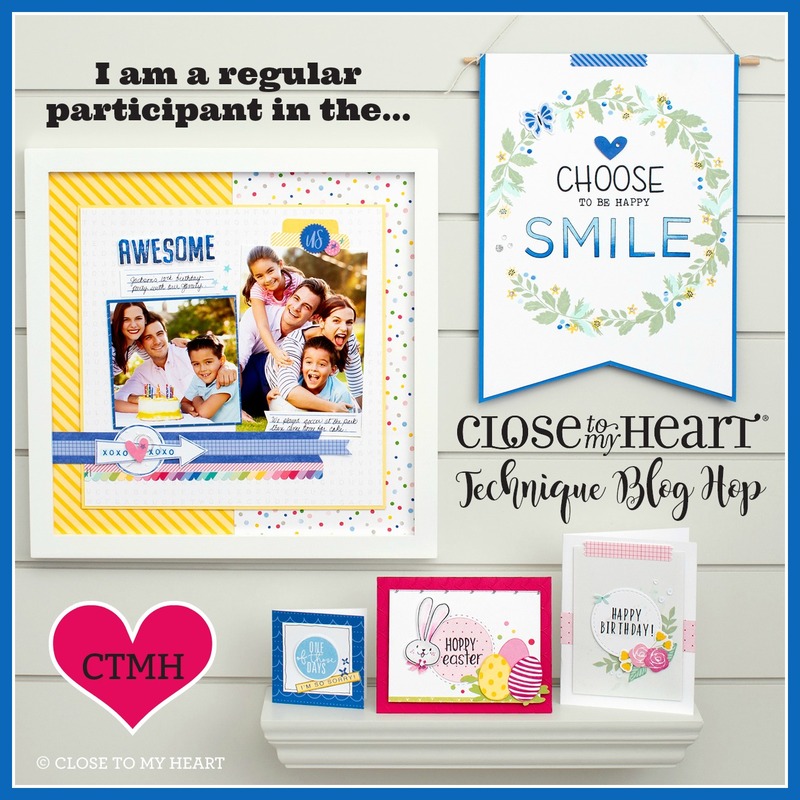 Consider linking up to our challenge by using Close To My Heart products in your artwork creation. To create the multi-colored teacup, I used the ShinHan Markers to create the Sea Glass handle and base. 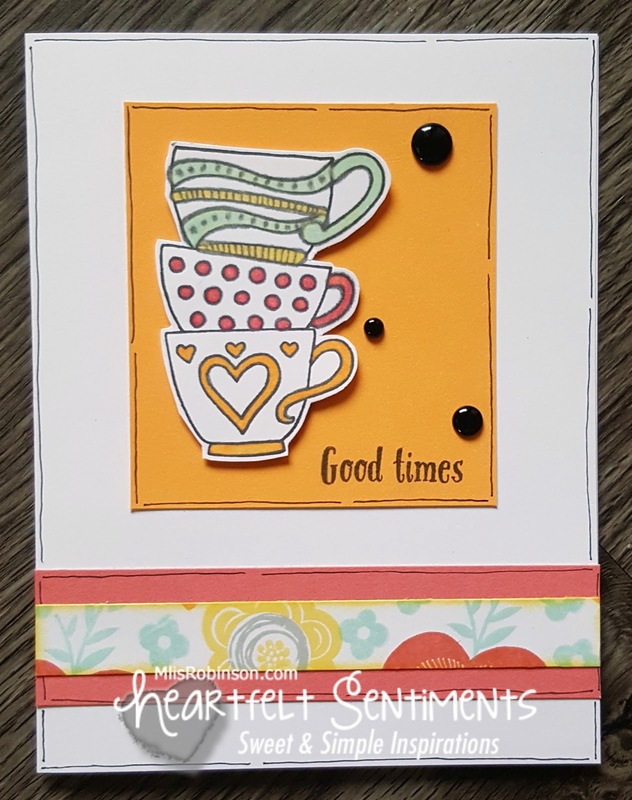 The Smoothie cup was created by stamping the teacup image on Smoothie Cardstock, adding the sentiment in Black Ink. Then I fussy cut it and glued it onto the main teacup. This is also a fun and much-loved technique that offers great potential. 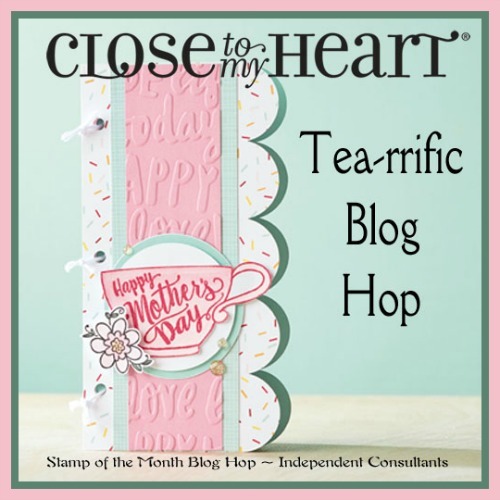 I love the little heart tag that is part of the Stamp of the Month set (available through the end of this month and only while supplies last). 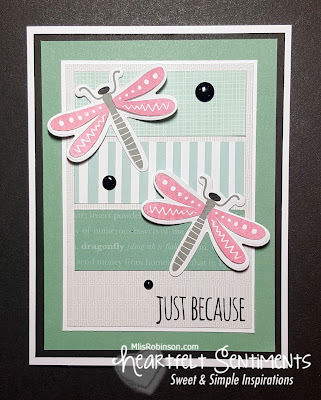 You can view more details about this card and others I made by random-stamping one sheet of cardstock. Click HERE to head that direction. Wishing you a great week, with beautiful weather! WELCOME to our mid-month Blog Hop where we are featuring our Thin Cuts; Close To My Heart's version of "diecuts". 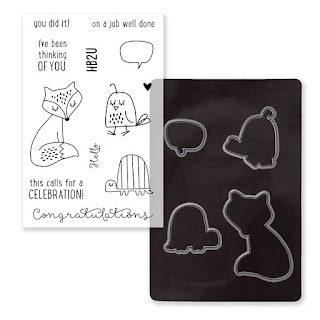 Our Thin cuts are metal dies of various shapes, packaged on their own magnetic sheet. They work well with most die-cutting machines. 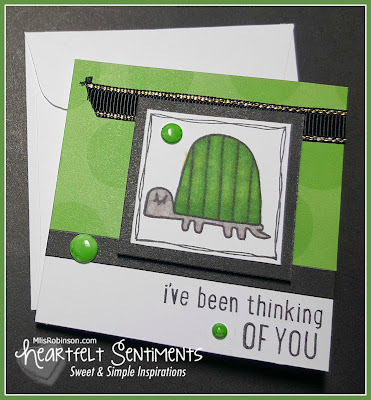 I use a Cuttlebug. 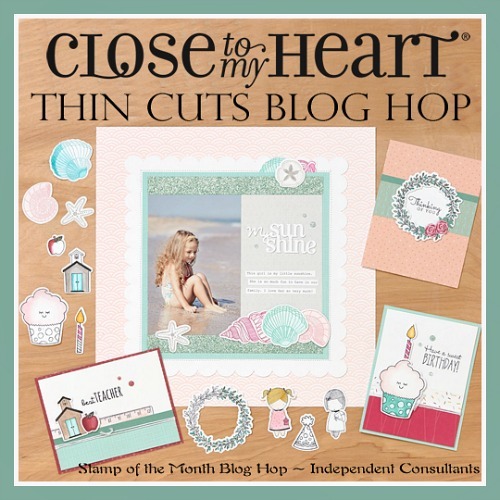 And...if you haven't already heard...the Thin Cuts are ON SALE this month (while supplies last) for 25% off! 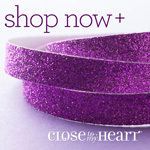 You can find a list of sale products by clicking HERE, as well as see their fabulous sale prices! Details about this special campaign can be found by visiting this link. If you are coming from Cat's Blog, you are on the right track. 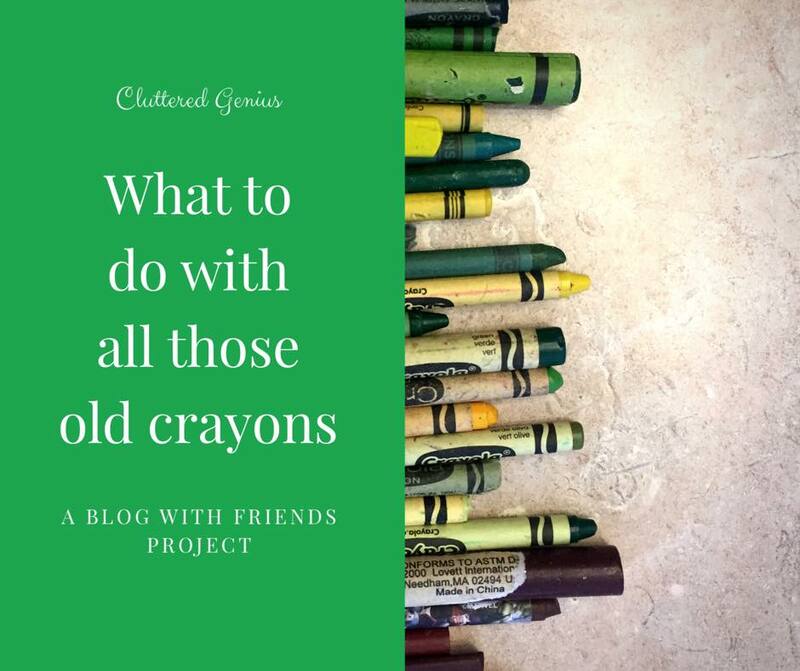 You can find a complete list of participants on this blog, if you were to get lost along the way. 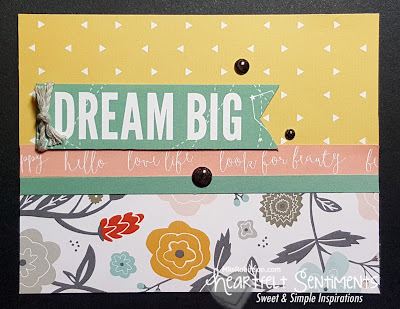 I decided to use the Dreamin' Big Cardmaking Thin Cuts Bundle for my card creation. 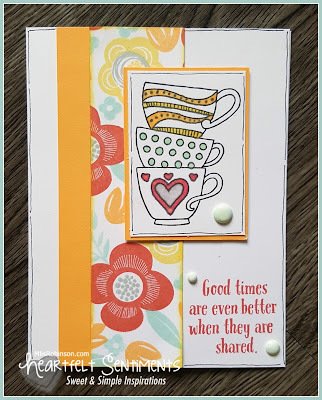 The fun, springtime images and sentiments allow for some fun artwork creations. This card came together really fast as I CASEd the design from my friend, Pamela Thorn. I love that I was able to use a variety of patterned patterns, from scraps of various paper packs, and then used Black, Juniper and White Daisy cardstock to accent it. You can see the dimension created on these fireflies by gluing down the abdomen and placing a small piece of 3-D foam tape under each of the wings. 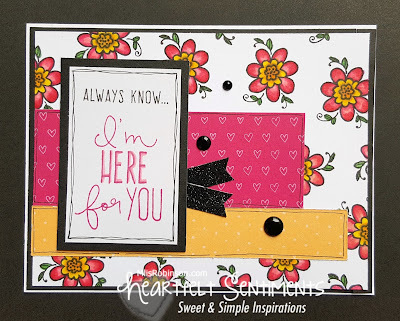 Black Dots, one of my current and favorite embellishments, were added as a finishing touch. I am going to tell you a secret...but don't tell anyone else... 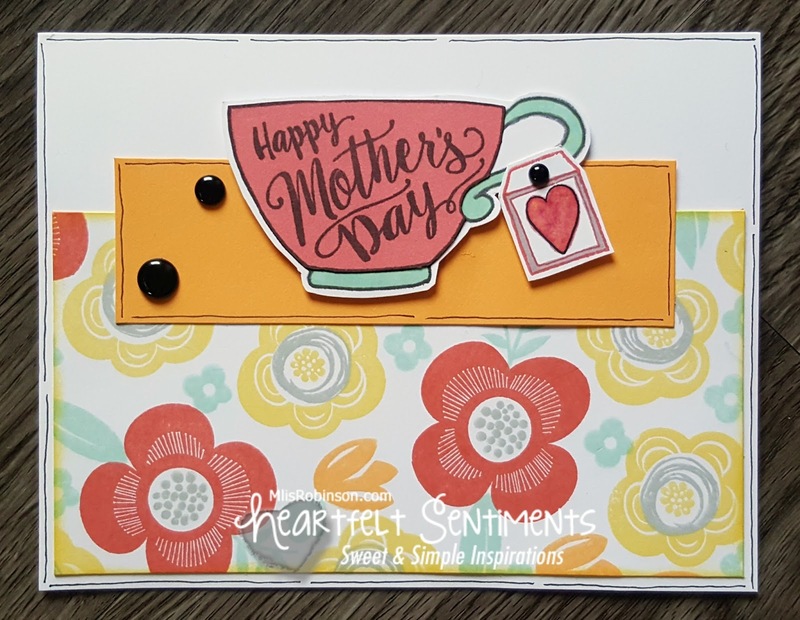 I didn't own this Thin Cuts Bundle when I created this card. I used my friend's, Judy Faye's, set a couple of weeks ago and fell in love so I placed it on my order and got it at the sale price! WOOHOO! 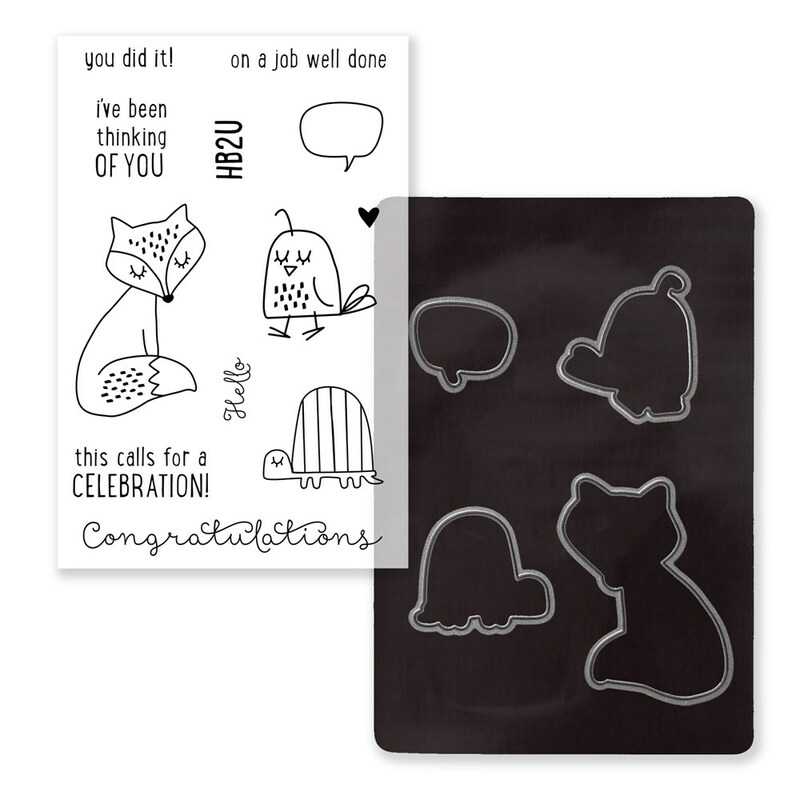 You will want this stamp set, too. Trust me. I LOVE the sentiments included with it because they serve various purposes. Thanks so much for stopping by. Please leave a comment before heading to Melinda's Blog. 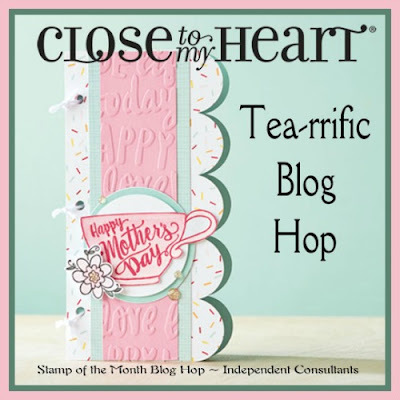 You are sure to find inspiration as you continue to move through our Blog Hop. We are thrilled to have you! 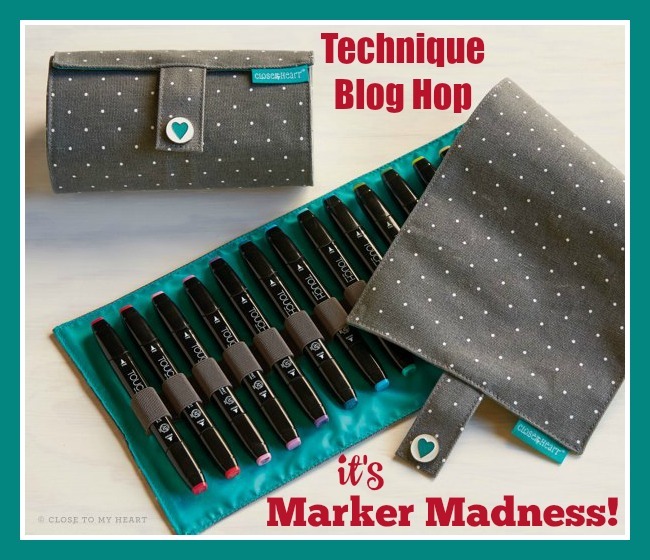 Welcome to this month's Technique Blog Hop titled, "Marker Mardness", where we are featuring the fun uses of Close To My Heart's ShinHan Markers. 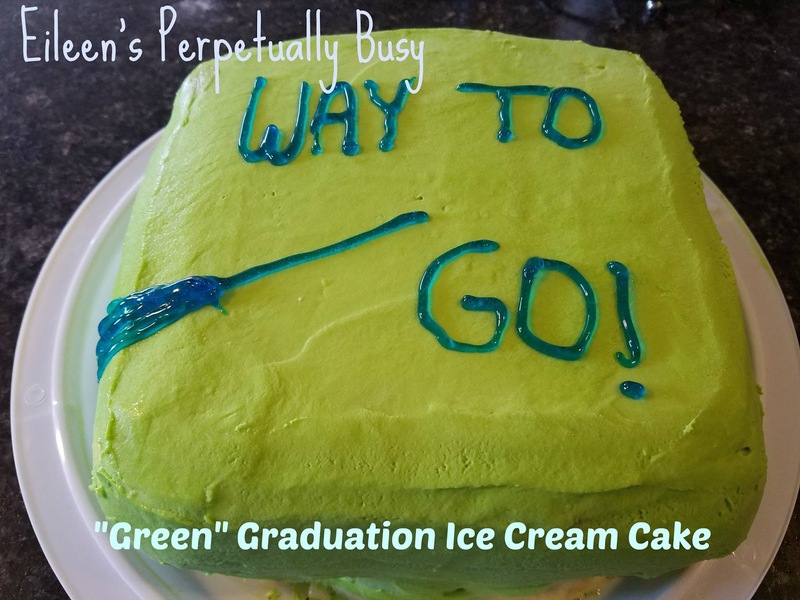 If you are arriving here from Debi's Blog, you are on the right track. Should you get lost along the way, you can find a list of participants at the bottom of this post. One thing I have worked to improve upon is the shading that is possible with color mediums. I love that the ShinHan Markers make this process easier for me with the use of the Colorless Blender. If you have these markers, this is a must-have. In my observation, it "removes color" providing for that effortless blending that I am definitely in need of. 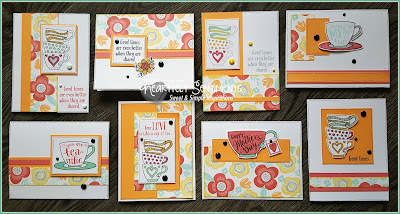 For coloring in these floral images from the stamp set called, "Tea-rrific", I used various marker shades to obtain the coordinating ink colors of Raspberry and Tangerine. Did you know you can actually layer on different (or the same) shades of ShinHan Markers and get a desired hue?! You can! In fact, Close To My Heart has provided a Marker Color Chart that tells you how to achieve CTMH-associated colors. 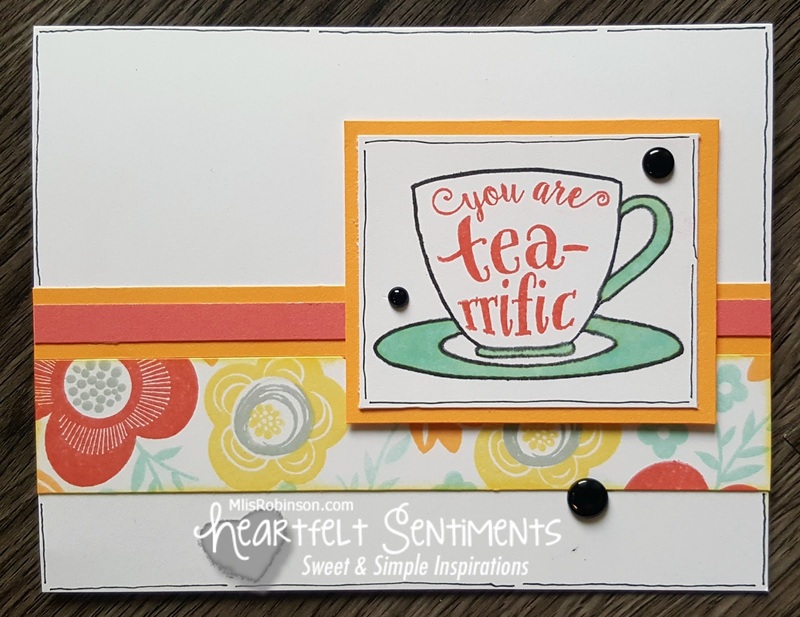 You can find this FREEBIE through this link. You can also add ink on top of ink to make the shade brighter. 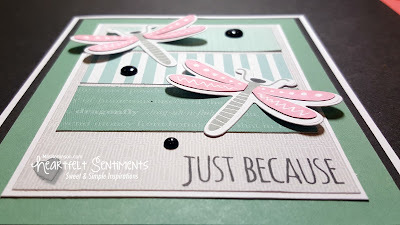 Blending-challenged like I am? Try the ShinHan Markers that can make you look like a pro (or semi-pro). Contact me if you would like to know how you can get some free! The repeated floral image was stamped from the March Stamp of the Month. I have highlighted the Tea-rrific stamp set in previous posts. You can view details about it here. The sentiment came from this exclusive stamp set included in a Caradking Kit called, "Here for You". 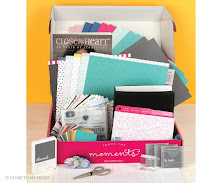 It comes with supplies to make 12 greeting cards. 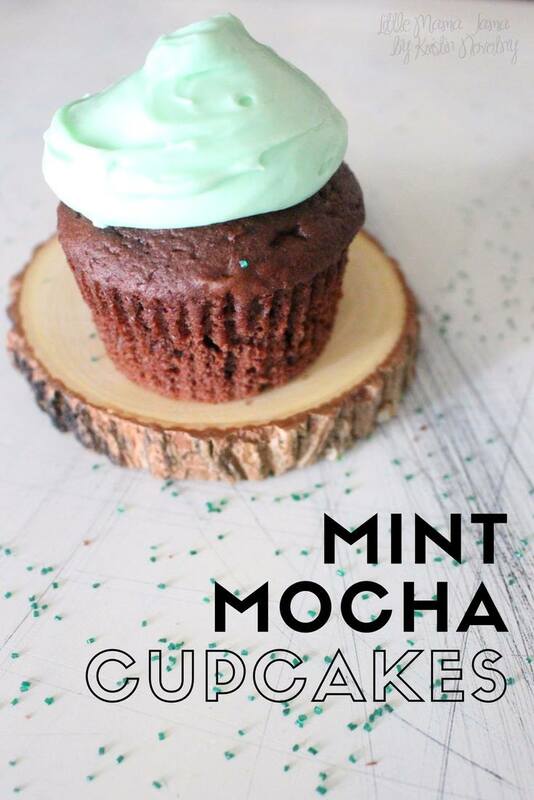 While I haven't created them yet, I will be doing so very soon! 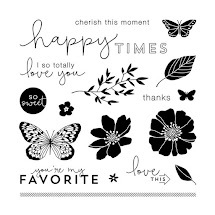 I love the beautiful floral images that can be used for various occasion. I especially appreciate the sentiments as they possess messages that are sometimes difficult for me to convey. Thank you so much for stopping by! 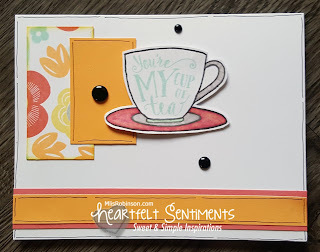 Consider leaving a comment and then head over to Haley's Blog to see what she has to share with you. 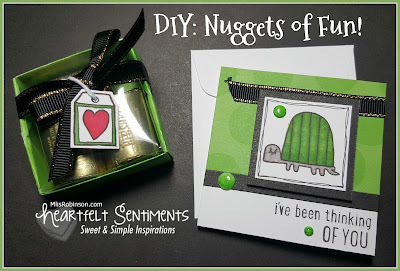 DIY: A Nugget of Fun! 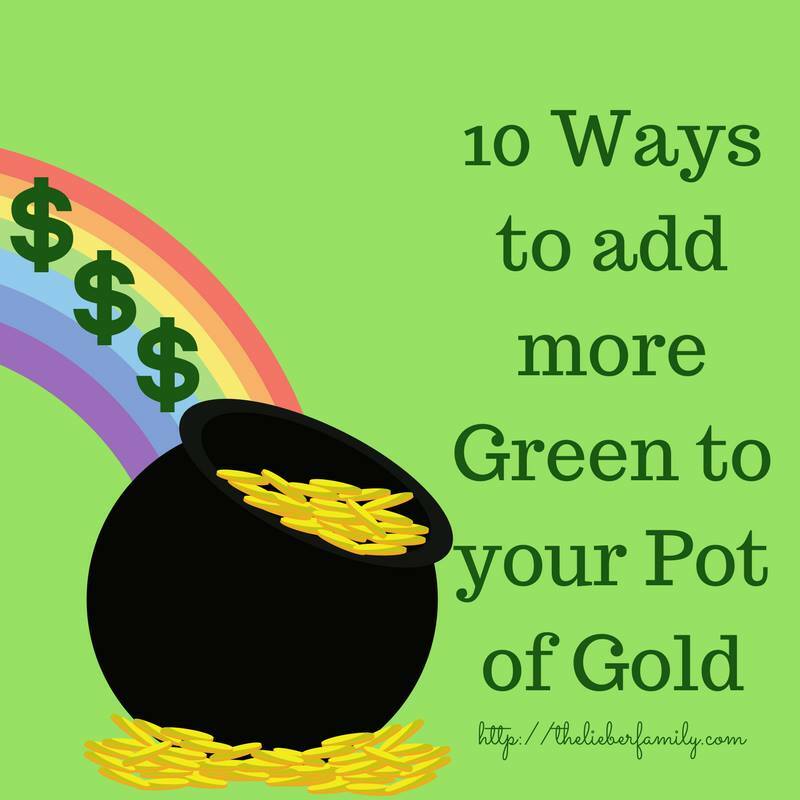 I am excited to join "Blog with Friends" this month as we focus on blog posts with the theme, "Green". At the bottom of this post you will find links to their blogs. I encourage you to visit their sites to enjoy seeing what they have to share with you. 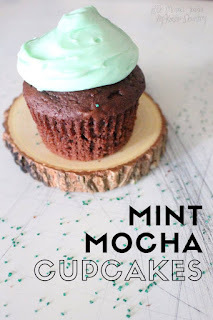 I am totally excited about what I have to share with you today because these projects are super fun, super simple to recreate, and super yummy; a great combination. 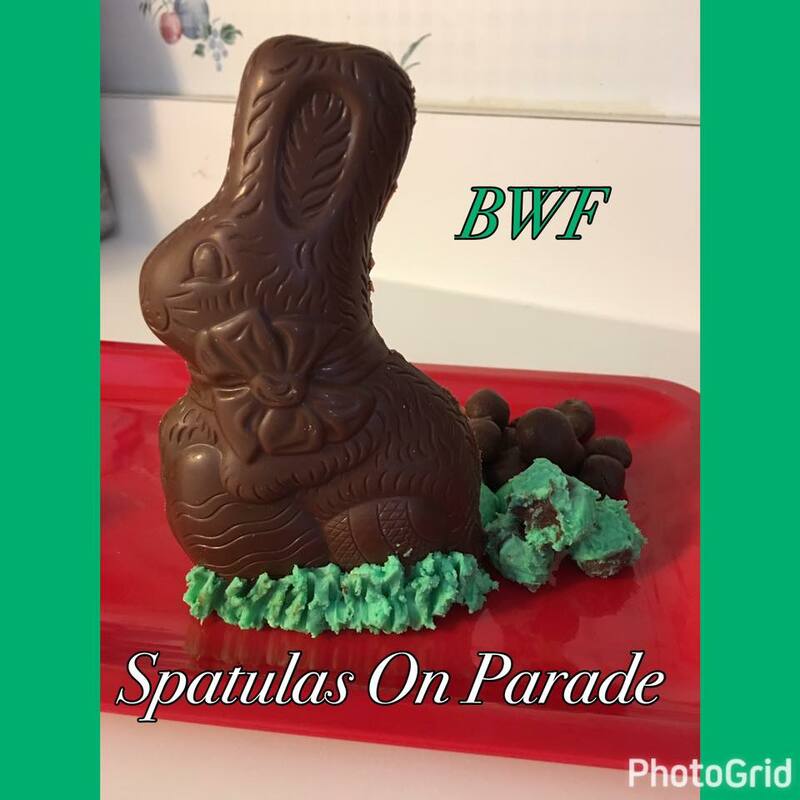 They make for great and cost effective gift items for anyone. 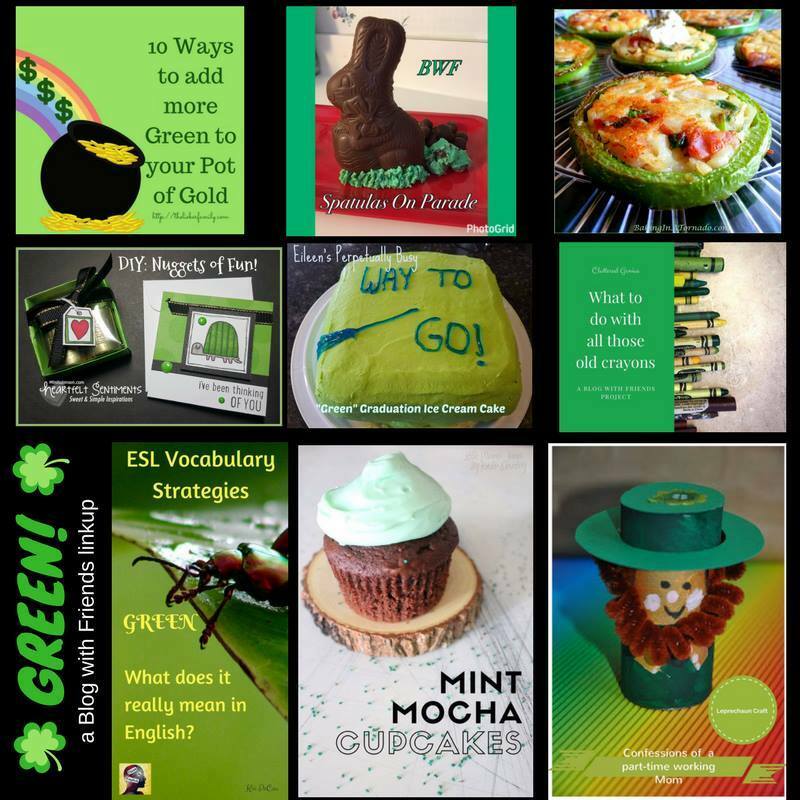 Obviously these are perfect for St. Patrick's Day goodies but are also great for any time of the year; gifts for teachers, neighbors, co-workers, Mother's Day, etc. 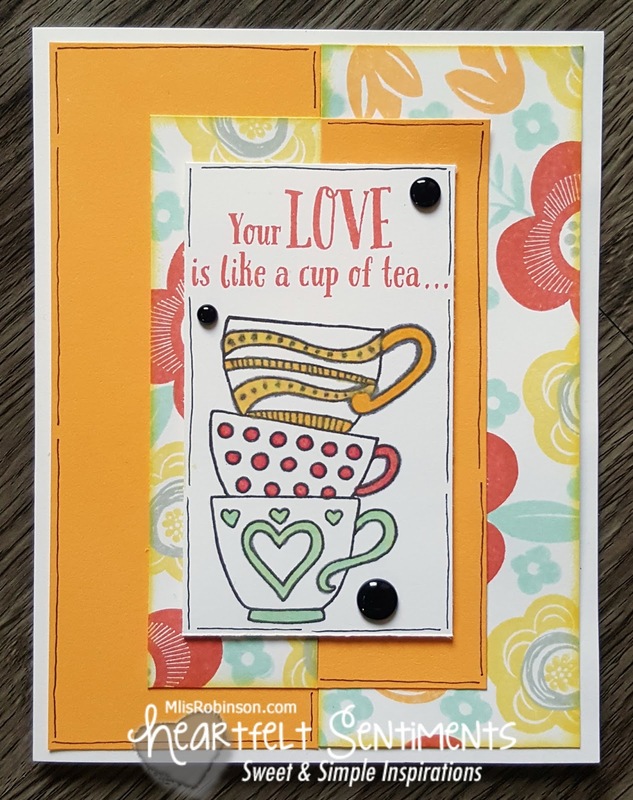 I enjoy making 3" x 3" cards to include with gifts. 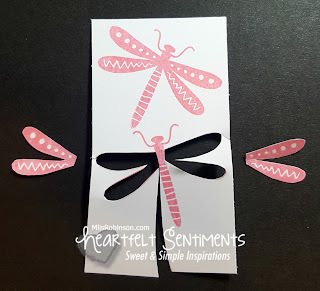 They are super easy to assemble and are cute! The patterned paper is from our Adventure Fundamentals paper packet. Black cardstock was added for contrast. 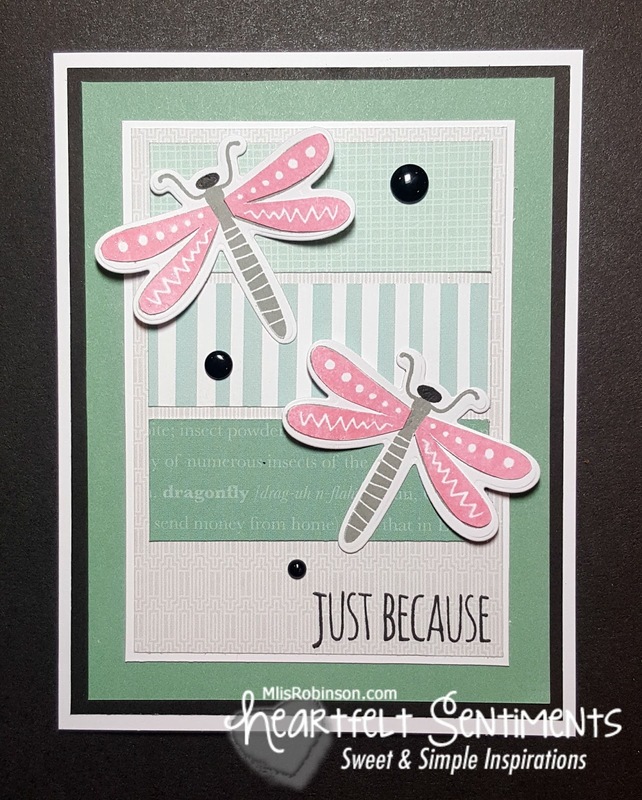 Black ink was used to stamp the focal point and sentiment with the ShinHan markers used to color the image and White Dots. 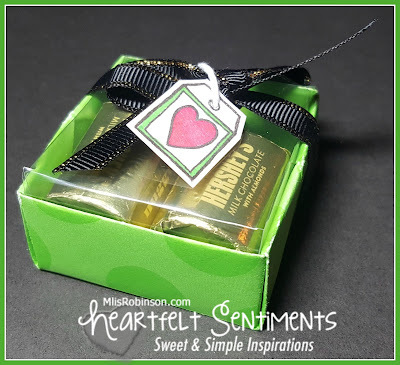 Black and gold ribbon was used from the Uptown Ribbon Pack. 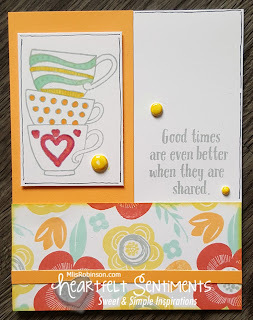 I used the Some Kind of Wonderful stamp set for the stamped images and sentiments. See anything you like? I would appreciate you sharing the content or image through social media. Continue checking out the "Green" blog posts as referenced in the visual and links provided below. Have a blessed week and always be sure to...Make It From Your Heart! 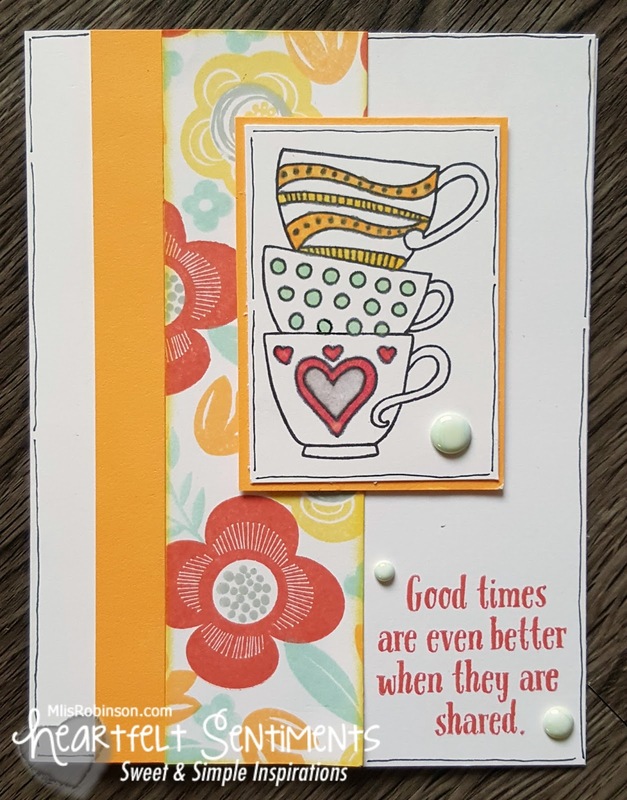 A couple of weekends ago I held a team training in east Texas where my team duplicated these cards, made with a random-stamped sheet of White Daisy Cardstock. 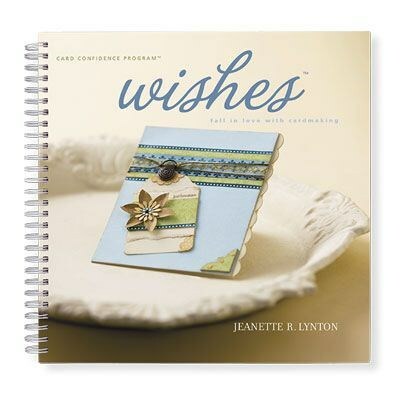 The patterns for the cards came from Wishes, with some slight edits made by me. Don't know what I mean by random-stamping? 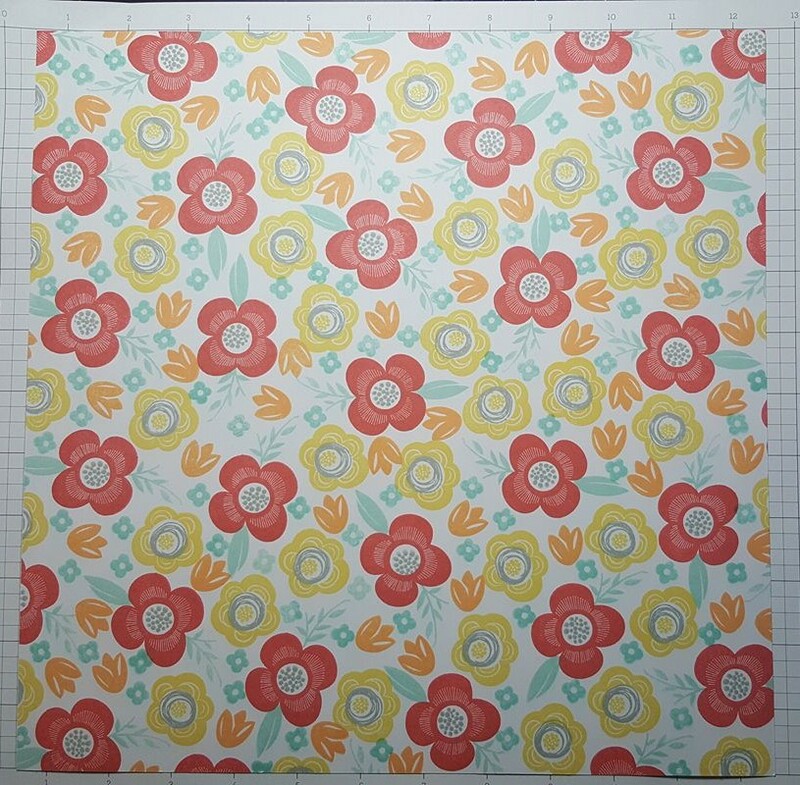 I mean...that I stamped this sheet of white cardstock, with various stamp images and ink colors, to create my own patterned paper. 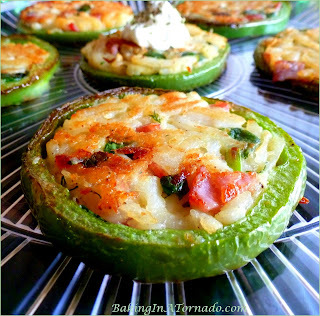 Cool, huh?! 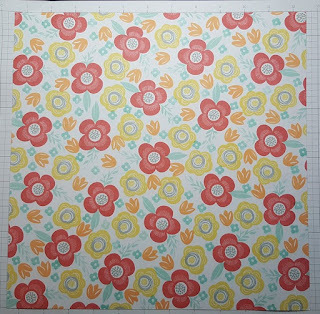 This technique means that you don't have to be concerned if you can't find the right colors or patterns of paper. 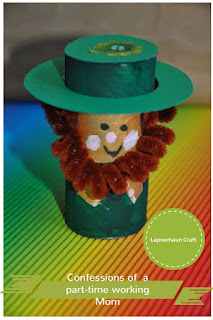 Instead, create your own! I did! 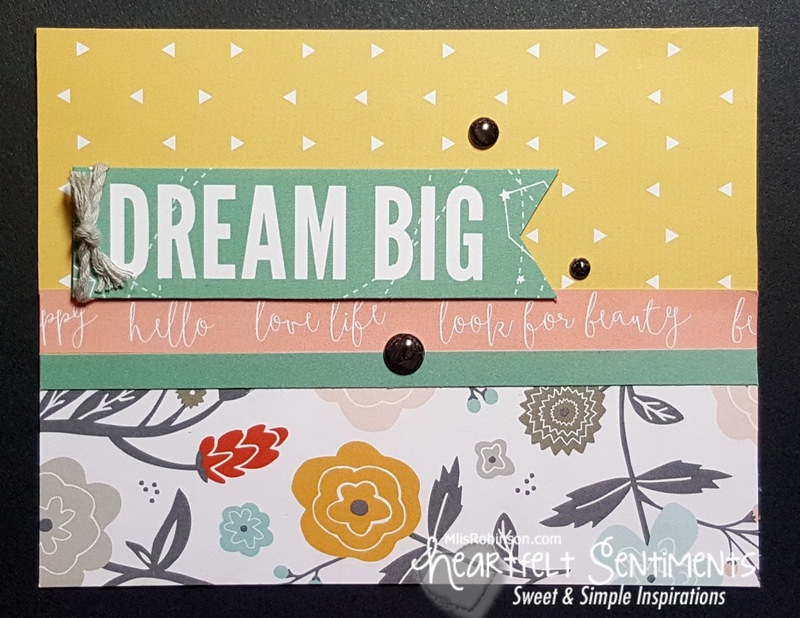 This patterned paper was cut up and used to create the cards shown, with a few additional products. 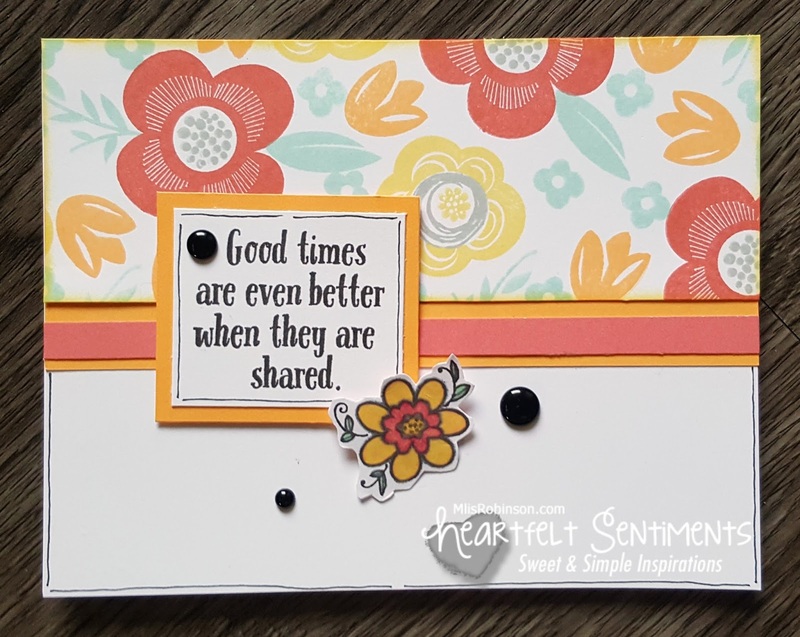 Wanting to create patterned paper with a floral design, I chose to use this stamp set called, "Shower Flowers". 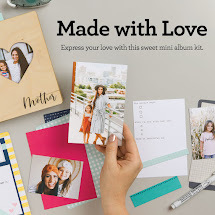 (Pssst...you can use ANY stamp set of your choice to do the same.) 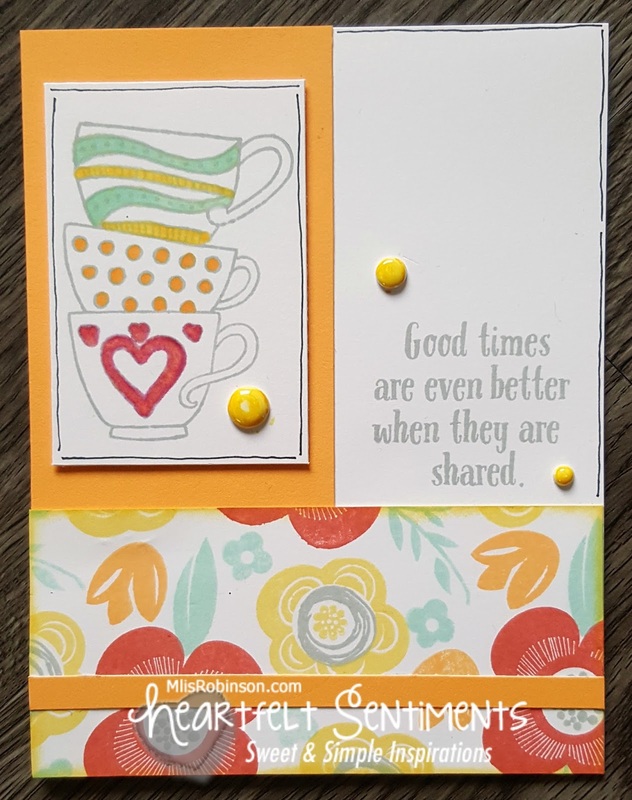 I used quite a few of the images, but you can also see there are some wonderful sentiments included as well as items to create your own event invitation. 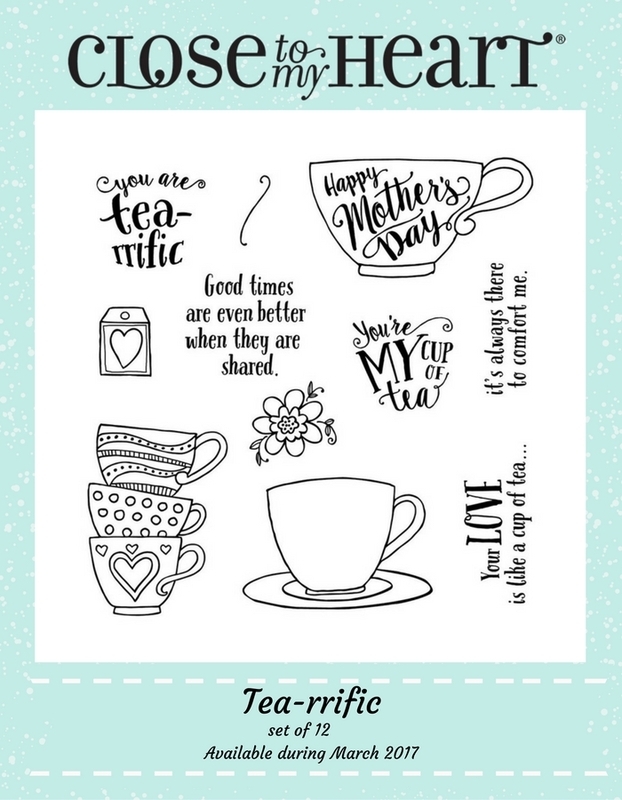 I hope you love these cards as much as I do. They truly make me happy and I hope they do the same for you! Here's wishing you a fabulous Friday and a wonderful weekend! Happy Monday...the first week of March 2017! Can you believe it? 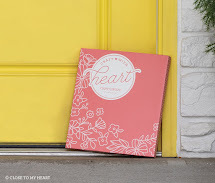 I hope you enjoyed a wonderful weekend and are excited for this month's Heart 2 Heart Challenge, "Time to Dream". It will be fun, as always, to see the interpretation of this theme. 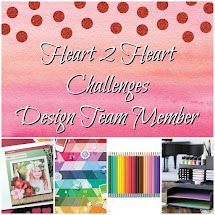 Be sure to use Close To My Heart products to link up to this challenge. I can't wait to see what you have to share! I LOVE the phrase, "Dream Big". It is something I say often or reflect on as much as possible. I truly believe...if you ain't dreamin' (yes, I said "ain't"), you ain't livin'. It was fun incorporating that phrase into this card, using the Dreamin' Big paper pack. This card was kept very simple and made using the "Lucky Layers" design from the Wishes How-To Program. This publication is a definite must-have (as are all the others). I appreciate that I don't have to come up with the original design of a card or layout. 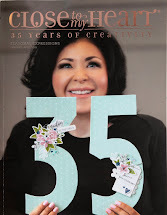 I just have to look in this beauty and reproduce what I see, with products that interest me. Consider joining in our challenge and be sure to..."Take Time to Dream", my friend! Have a blessed week! 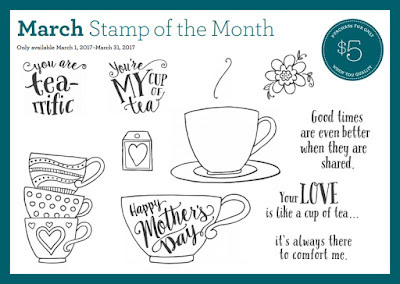 Thank you for joining us for this month's Stamp of the Month Blog Hop featuring the adorable stamp set, "Tea-rrific"! It has such great potential and I am sure we will see beautiful artwork created with it! It can be yours for just $5. Read those details here. If you are coming from Michelle's Blog, you are on the right track. You can find a list of participants by clicking here. 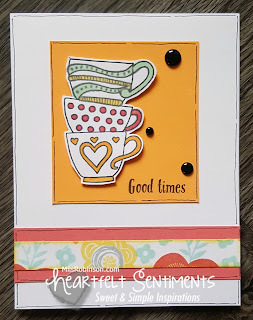 I had fun creating 16 cards with this stamp set. (They are showcased here.) The images and sentiments are perfect for Mother's day, as well as for celebrating friendships or love for others. 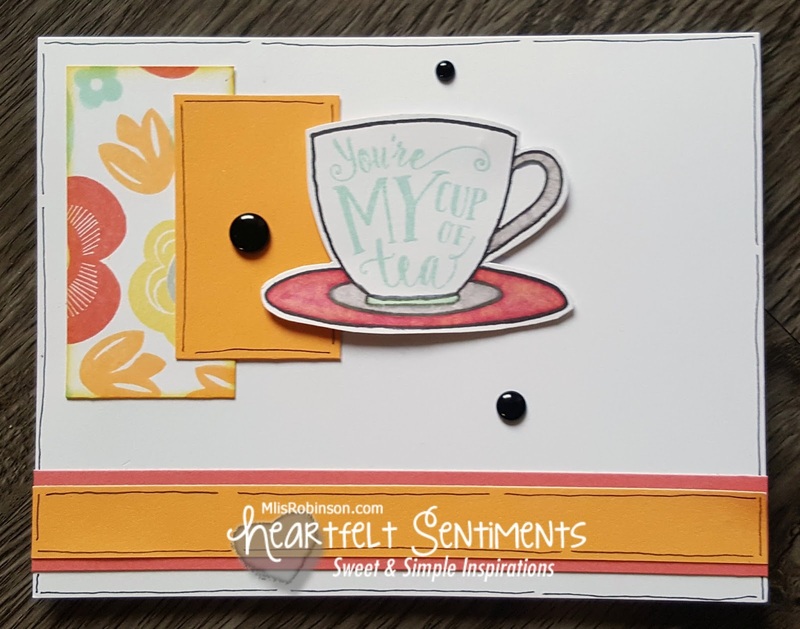 To color in the teacup image, I used our ShinHan markers and blended them to create the desired hues - Tangerine, Seaglass, Smoothie and Whisper. 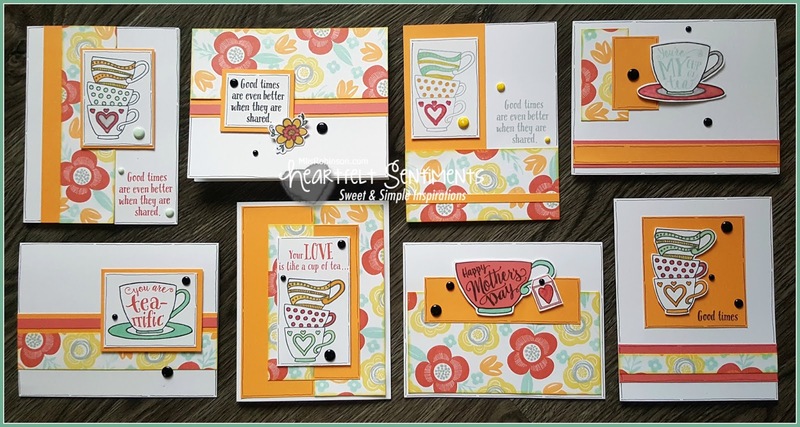 They coordinate with the stamped images created on the floral pattern which is handmade. 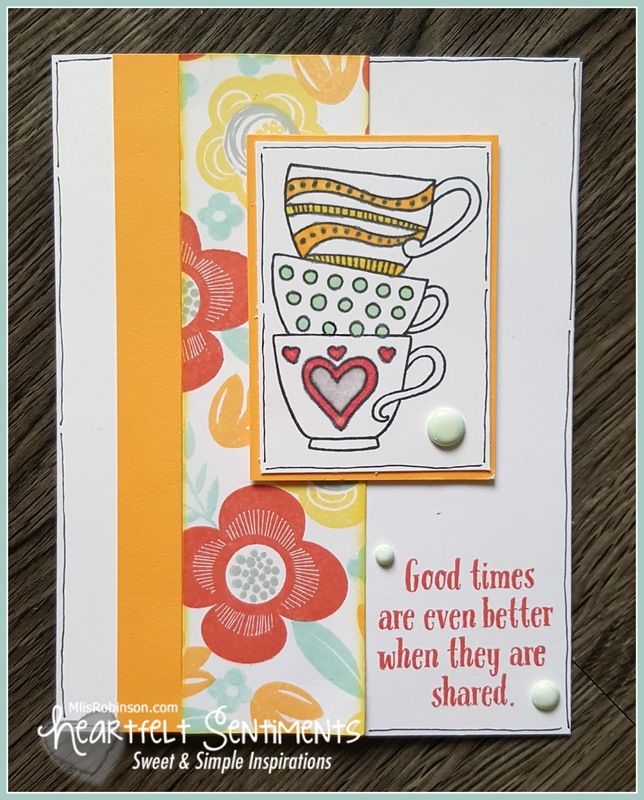 I love adding the White Dots - which can be colored with the ShinHan Makers. I love being able to do so (although I left them white here). 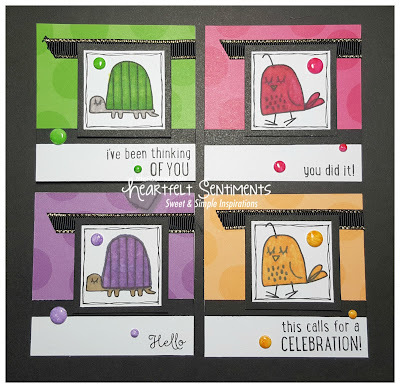 I know I will be using this stamp set all month long to create some fun artwork. 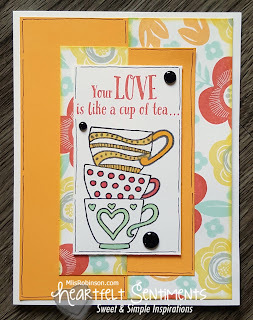 Now head on over to Melinda's Blog, where you are sure to be inspired. Cut It Out! 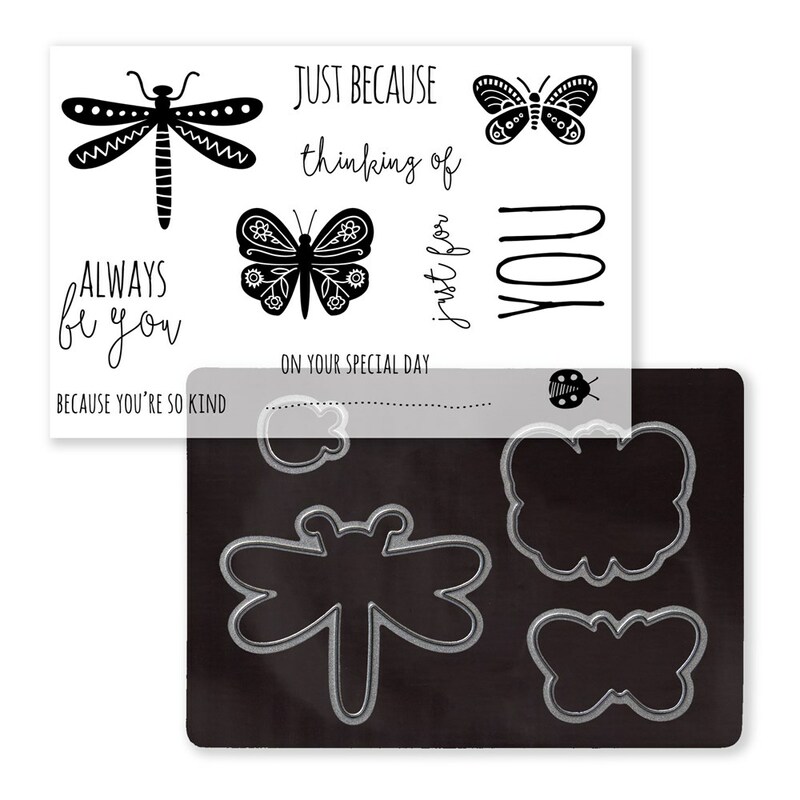 THIN CUTS - 25% OFF!